Without a doubt one of the BEST books on sparking ideas that I have ever read." IN TIMES OF CHAOS, the deck gets reshuffled and the rules of the game are changed. To thrive, companies must learn not to create structure and stability, but rather, to adapt quickly. Exploiting Chaos suggests that the next wave of management theory will be the science of adaptation. 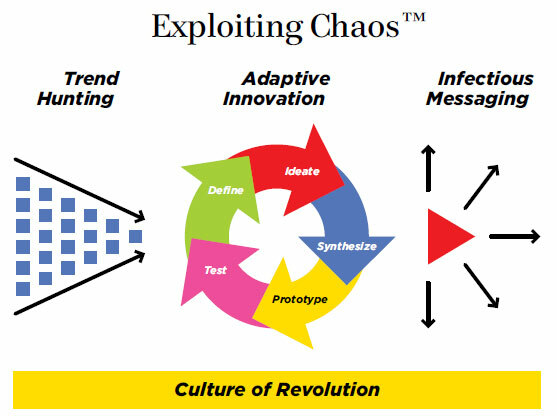 Accordingly, this book approaches adaptation using four equally important tactics: Culture of Revolution, Trend Hunting, Adaptive Innovation, and Infectious Messaging. 1. Consume the content front-to-back. 2. Just read the headlines on each page. They flow together and will help spark your next big idea. "Love the book - best book on innovation I've read and I get 10 a week." "Without a doubt, this is one of the best books on sparking ideas that I have ever read. I read it from cover to cover, but believe that even good skim will have you reaching for a blank piece of paper and pen or a fresh Word document. Get yourself a copy of Exploiting Chaos. It could be the difference going forward." "A love potion for relentlessly creative souls looking to break boundaries, ignite customer passion and start a revolution." "One of the Best Books for Business Owners, "Presented in an appealing, magazine-like format." "EXPLOITING CHAOS is a rousing battle cry for the kind of creative, risky thinking that is most needed in times of change and disorder. Whether you're a CEO trying to stay ahead of the curve, a daydreaming teenager, or a wannabe trailblazer, this bold guide is the shake-up you need to check your assumptions, get inspired, and turn business-as-usual totally upside down." "The cutting edge as we contemplate what's next for brands, commerce and consumerism." "Not surprisingly, it's hot, hip and absolutely worth talking about." "A work of genius-in-a-flash brilliance and choose-your-own-adventure engagement." 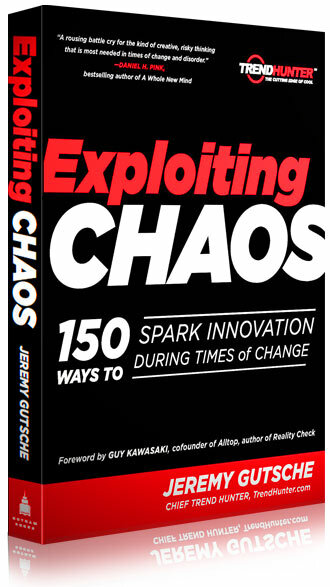 "With its visual design and cutting edge ideas, Exploiting Chaos represents the future of business books. Jeremy captures a new way of thinking for anyone looking to hit on the next big thing." "Chicken Soup for the Confused Executive's Soul." "The book is a quick read, with lots of graphics, oversized headlines on each page, and memorable quotes." "What a great installment... a quick, easy ready with tons of insightful facts." "[As a keynote] it was the most energizing, inspiring and applicable piece of stand-up I have ever seen. And I've heard Bill Clinton speak, listened to enough Bill Gates on YouTube and sat through my fair share of Tony Robbins CDs." "Gutsche has just released, Exploiting Chaos, a book that is, in a word, stunning. And it would be stunning if it didn’t become an instant bestseller and classic, and catapult its young author onto the current guru pantheon alongside trend spotters and commentators like Wired editor Chris Anderson and pop sociologist Malcom Gladwell."